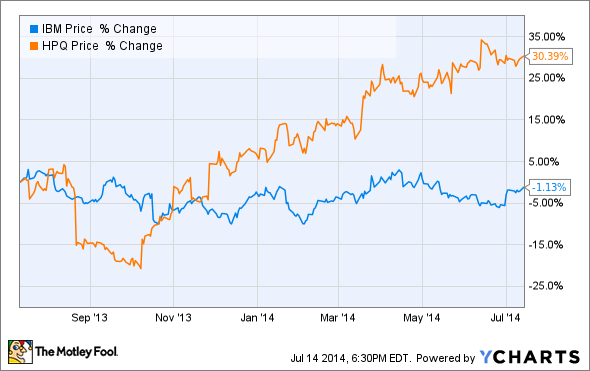 IBM Earnings Preview: Does Revenue Growth Really Matter? IBM is set to release its earnings on July 17, and analysts are expecting continued revenue declines. Shares of IBM have been stagnant as revenue has declined, being outperformed by competitors like Hewlett-Packard, but is revenue growth really that important? Shares of International Business Machines (NYSE:IBM) have been essentially flat over the past year, fluctuating around the same level due to concerns that the company's hardware business is falling apart. During the first quarter, revenue from IBM's Systems and Technology group declined by 23% year-over-year, and the segment recorded a $660 million pre-tax loss. The market hasn't been kind to IBM in light of these results, and the company's stock has been greatly underperforming other sellers of enterprise hardware, such as Hewlett-Packard (NYSE:HPQ). As IBM prepares to report its second quarter earnings after market close on July 17, analysts are expecting continued revenue declines. The most important question that investors need to ask themselves is: does it really matter? Revenue stagnation is nothing new for IBM. Over the past decade, IBM's revenue has been essentially flat, so the company's recent troubles really aren't out of the ordinary. While revenue hasn't been growing, earnings per share has tripled over the past decade. A combination of rising margins and aggressive share buybacks have pushed the company's EPS from about $5 in 2004 to $15 in 2013, all while revenue has only grown by 3.5% during that time. Why hasn't revenue been growing? Because IBM has a history of selling off businesses where it is unable to gain or maintain a competitive advantage. The company sold its PC business back in 2004, and it's currently attempting to gain approval for the sale of its x86 server business. In addition, Bloomberg recently reported that IBM is close to a deal to sell its chip foundry business, estimated to be losing as much as $1.5 billion per year, to Globalfoundries. IBM has no advantages in either the x86 server business, where most servers are powered by Intel chips, or the chip foundry business, which has become ultra-competitive in recent years. Given the choice between growing revenue and ditching lackluster businesses, IBM typically chooses the latter. The sale of businesses like these, and the focus on areas where the company has a competitive advantage, is why IBM's revenue growth and earnings growth have deviated by so much in the past. The recent results from competitors in the server business bear out IBM's decision to sell. Hewlett-Packard relied on enterprise hardware for about 40% of its operating profit in its most recent quarter, and servers make up a large part of that segment. During the past two years, HP's enterprise hardware operating margin has been in continual decline, falling from around 18% to just 14.4% in the most recent quarter. Much like PCs, x86 servers are increasingly becoming a commodity, and IBM has done a far better job than HP in the past of relying too heavily on commodity products for its profits. There are a few major catalysts for IBM going forward that investors should keep an eye on. First, once IBM closes the sale of both its x86 server operation and its chip foundry operation, the bottom line should see a significant boost. Both businesses are losing money, and shedding those assets will help undo some of the margin compression that IBM has suffered in the recent past. Second, the mainframe business will eventually recover. During the first quarter, revenue from System Z, which is IBM's mainframe computer system, declined by a whopping 40% year-over-year. This may sound terrible, but the mainframe business is cyclical, rising when IBM refreshes the hardware, and declining in between. There's no reason to believe that the current decline is any different, as many industries, like banking, remain locked into the mainframe ecosystem. Third, investments in new R&D projects should continue to drive innovation at the company. IBM's Watson, the Jeopardy-winning computer system that IBM developed to process natural language and make hypotheses, is being turned into its own business unit with a $1 billion investment, and IBM hopes to derive $10 billion in revenue from the system within the next decade. Watson has plenty of possible applications, ranging from aiding doctors in making diagnoses to creating the perfect barbecue sauce. IBM is also investing $3 billion over the next five years in advanced chip design, with plans to push transistor sizes down to 7nm, possibly using exotic materials like carbon nanotubes as an alternative to silicon. This is a big investment, representing about 10% of the company's annual R&D spending, and there are very few companies on earth with the expertise necessary to attempt such a project. If IBM succeeds, it could lead to enormous gains in processor performance and efficiency. This is a long-term project, so don't expect progress anytime soon, but IBM is positioning itself to lead the way as the amount of data that companies are dealing with continues to explode. While IBM will likely report another revenue decline, it seems that a mountain is being made of a molehill. IBM's revenue hasn't really grown for a decade as the company has shed underperforming businesses, and its focus on areas where it can gain a competitive advantage has led to exceptional margins. Going forward, IBM is making investments in the future while it exits commodity businesses, and the result should be long-term earnings growth for the company.